BOSTON and LOS ANGELES – November 12, 2014 – A recent study, conducted by Worldcom Public Relations Group partners Schneider Associates and The Pollack PR Marketing Group, revealed that colleges and universities need to be concerned about marketing to a decreasing crop of prospective students (enrollment rates down .8% from last year), who are significantly more critical of and less responsive to traditional marketing tactics. According to the “iGen Goes to School” study, college admissions and communications programs are not resonating with today’s new cohort of digital natives. 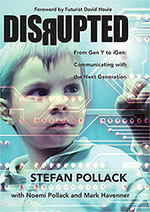 Dubbed the “iGeneration” by Stefan Pollack, author of Disrupted, iGens are those born between 1994 and 2004 and require “information on demand” with a professed inclination to trust the advice of “friends,” or strangers, who share their opinions freely on social media platforms. The two-part study consisted of four qualitative focus groups conducted in Boston, New York and Los Angeles, and a quantitative online survey of 130 current or recent college applicants. Findings indicated that iGens are dissatisfied with the impersonal nature of traditional college communications outreach, signifying a serious disruption in the higher education enrollment process, which includes a barrage of emails, view books, letters and other print communiques addressed “Dear Student or Applicant,” and are often deemed irrelevant to the audience. Students want to engage with schools on their own terms. Today’s digital natives are likely to use social media and other online resources to learn about a higher education institution, with Facebook (67%) being the top social media channel. Of those surveyed, 92% of students said they used social media at least a little during the application process and 60% of applicants felt comfortable contacting schools through social media. iGens desire authentic, personalized outreach from people similar to them. Of those surveyed, 43% stated personal contact influenced their decision to attend a college or university, such as one-on-one communication with a current student or engaging content such as videos. Applicants place importance on program specialties and digital presentation. Participants indicated that course/program offerings (48%) and school reputation (44%) were critical influencers in enrollment. Also, of those surveyed, 38% said that a school’s website was the most trustworthy source when learning about a school. Pollack suggests a ‘research and replace’ strategy that questions the efficacy of every outgoing communique and uses new, personalized messaging and visuals on platforms that will connect with iGens. According to the study, iGens crave personalization and expect schools to understand their needs and demonstrate they want a student as much as the student wants the specific institution. Much as students have to convey demonstrated interest, schools must understand the personalities, skills, talents and desires of this emerging generation and relate those to what they have to offer. Schools need to mine their data and personalize messages to prospective students, highlighting the features, benefits and educational opportunities that will make sense to iGens. Schneider Associates (SA) is a full-service integrated communications agency and a member of Worldcom Public Relations Group, the world’s largest network of independent PR agencies. SA successfully launches and accelerates visibility for new consumer products, professional services, educational institutions, organizations and communities. SA provides integrated services in PR, public affairs, influencer campaigns, digital marketing, social media and creative services. The agency specializes in Launch Public Relations® to build or revitalize awareness, excitement and sales. To learn more, visit: http://www.schneiderpr.com, or follow us on Facebook, Twitter and LinkedIn. The Pollack PR Marketing Group (PPMG) is a 29-year old multi-specialty agency that develops communication platforms and programs, manages corporate reputations, launches new products and services and promotes brand engagement for clients ranging from start-ups, to Fortune 500 companies, with a focus on consumer products and services, technologies and professional services. PPMG is a partner in Worldcom Public Relations Group, a partnership of 140 partners across 43 countries. For more information, visit http://www.ppmgcorp.com, or http://www.pollackblog.com, or follow us on Twitter. Worldcom Public Relations Group is the world’s leading partnership of independently owned public relations counseling firms, with 140 partners in 43 countries, across six continents. Established in 1988, partners serve national, international and multi-national clients, while retaining the flexibility and client-service focus inherent in independent agencies. Through Worldcom PR Group, clients have on-demand access to in-depth communications expertise.